Although the weather was incredibly hot in April, I still had an amazing time on this tour! I highly recommend! Really good tour! Much better than I thought - the stops were at amazing places, the boats were fast (and reasonably comfortable), the views were incredible and the crew were gracious and non-invasive! Lunch was provided and delicious! Plenty of water available too! We enjoyed the tour so much especially kayaking. The view is awesome, food is nice but sad to see all the dead corals while snorkeling. Very friendly staff, lots of things packed into the day compared to other tours. I booked this tour and found it fantastic! The guide was delightful, funny and relaxed with my fellow travellers. There was plenty of time to enjoy just relaxing, lunch was perfect and the lagoon climb worth every step....and there were quite a few! I would highly recommend this trip as always Viator ensures professionalism, diversity and fun. I did this trip with two girlfriends, and we had an absolute blast! The kayaking locations were breathtakingly beautiful and the snorkeling was great. Hiking up to the Koh Mae Koh lagoons was a workout well worth it. 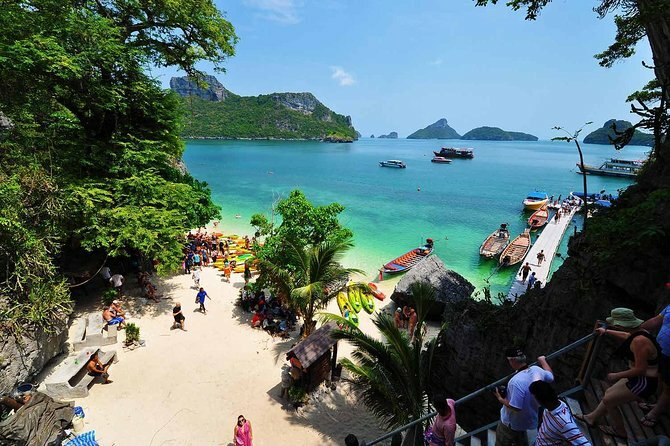 What a wonderful way to explore Angthong National Marine Park! We were picked up from our hotel at the time confirmed to us via email prior to our trip, and then it was just a short ride in our air-conditioned minivan to the pier. At the pier, we boarded a small speedboat with just 20 or so others, which was great as the other tours were going out on much larger boats with big groups. We made our first stop at a beautiful cove, where we spent roughly an hour snorkeling. Then we continued to Mae Koh for views over Angthong and the island's pea-green lagoon. After, we enjoyed a scenic boat ride around the park before stopping at another island for lunch on the beach and kayaking. I would definitely recommend this tour for anyone staying on Koh Samui. This was a great day trip. Pick up and drop off at our hotel included. Really enjoyed the snorkeling and kayaking. Lunch was also very good, plenty of drinks and snacks. We had a good day, would do it again! Overall this was a great day trip, and well worth the cost. As others have mentioned, the speed boat ride is definitely bumpy. I tend to get seasick, but I took a preventive Dramamine and did just fine. Snorkeling was the 1st stop, and it was my favorite part! We snorkeled for about 45 mins/1 hour. I was a little disappointed that we wouldn't be able to snorkel again, since the description of this tour reads spend the afternoon sunbathing, swimming, snorkeling, kayaking... Unfortunately there was no option to snorkel again - when we got to the main island, you had to choose to either kayak or hike to the top to see the views of the whole national park. My boyfriend and I opted for the hike - which was pretty tough!!! He made it to the top, and the view was amazing. He said it was well worth it, but it's definitely an advanced hike. There were signs up that the trail was under construction - it looks like they're adding a lot more concrete and better ropes to hold onto, so maybe it will get a little easier in the future. Definitely bring sneakers if you're planning to try the hike! Our guides provided plenty of bottled water throughout the day - each time we got back on the boat, they offered everyone nice and cold bottles. Lunch was just okay not that much in terms of selection and it seemed to have been sitting out for awhile and attracting flies. My advice is to bring a few snacks! But overall an enjoyable day trip with beautiful sights to see. Beautiful Islands, and a happy go lucky tour guide. I really loved this tour! I have only given 4 stars because there is no mention of a hike in the description, and there was a mini one, up loads and loads of stairs. If my husband had known that he and almost everyone else on the tour would not have worn flip flops. So be warned people, there is an optional hike, so wear proper outdoor sandals or trainers! Trip was okay. Dont expect too much. Lots of sitting around, waiting. Kayaking was really boring, we didnt get to go up to the main viewpoint. Snorkeling was the only great part, crazy amount of fish and corals, clear water. Would do it again for the snorkeling but other than that not worth it. We liked the operator of this tour - most impressive is that everything provided is very new and clean - this includes the life jacket, snorkel equipment and speed boat were all very clean and hygienic. This operator is more pricey compared to other cheaper operator but I think it is worth it from the new and cleaner kits provided. We felt this tour trip was just average and in fact disappointing because of our lousy snorkeling experience - the visibility was extremely poor and there were only a few fishes sighted during the 1 hour snorkel. It felt a terribly long 1 hour. Our kayaking experience was much better but also nothing special. We thought this tour would be the highlight of our 1 week holiday trip in Samui which now appeared to be just a slightly below average experience. I would only recommend this to people if you have more time to spend in Samui - else there are other better activities to fill your limited valuable time. Good trip but speed boat part very bumpy made worse as we had to detour to another island to pick up and return some other people which we were not expecting to do. The boat ride to and from the park was bumpy and difficult on the body. The weather was bad so I would only do this trip on a very calm day. It was lovely except that we were the only english speaking people on there and the guide only spoke in Russian to the others and only spoke to us when we asked a question..The food was lovely and the boat was comfortable. but the snorkelling wasn't that great. The tour info says: "45-minute speedboat ride". It took an hour and a half both ways as we took a detour to Ko Phan Ngan to play pick up people. I specifically chose this tour for the 45 minute ride to have more time everywhere. Snorkeling and kayaking was very cool though. The instructions for finding the meeting point were vague and unclear. We barely made it in time despite giving ourselves an extra half hour. Most get picked up but since we had our own car we opted to drive. The tour itself was fun and pleasant once we got passed our morning rush. We felt a bit rushed at each stop though and would have liked more time. This is really for people who want to snorkel and kayak only. We planned to relax on the white sandy beaches instead but there were no beaches to be found. The food at lunchtime was good.